View personal data related to policy information and claim and payment histories. Quickly access policyholder information including claims history, plan coverage details and much more. View status of applications submitted by you or your agents and their policyholder information. View status of applications submitted by your agents and their policyholder information by enrolling agents under your hierarchy. Are you a policyholder, provider or do you represent an agency office? The Polish Falcons Web Portal is a simple platform providing you with instant access to all your data. Need your information right away? Use your desktop, tablet device or mobile phone to access your data immediately. Polish Falcons Web Portal, Please login. With portability in mind, the Polish Falcons of America Web Portal was designed using the latest technology to ensure compatibility with all modern smart phones and tablet devices. All the information you need is just a tap away! 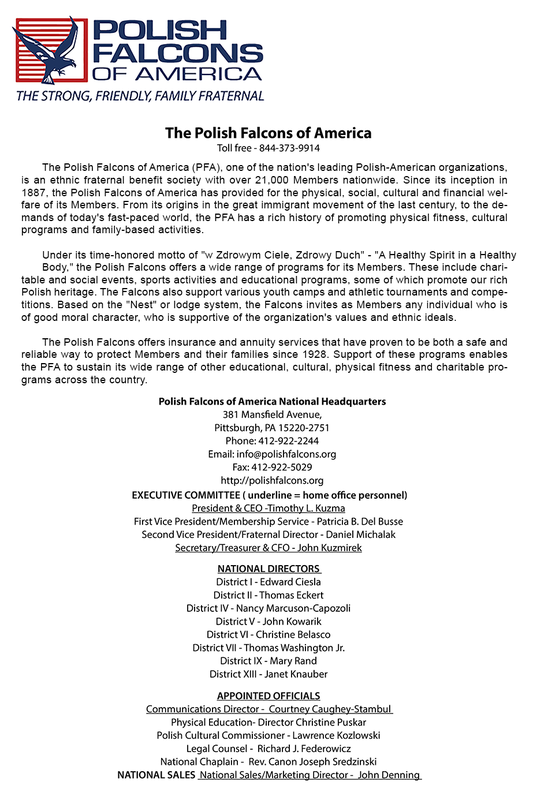 The mission of the Falcons has been to promote physical fitness within the Polish community, while providing meaningful support for the wellbeing and welfare of Polish-American families. Today, the Polish Falcons offers numerous Member benefits, insurance services, physical education programs and cultural activities to over 23,000 Members throughout the United States. Please enter your Annuity policy number with corresponding owner information. If you do not have policy information, please contact us at 844-373-9914. Please enter your Medicare Supplement policy number with corresponding insured information. If you do not have policy information, please contact us at 844-373-9914. Please enter your Dental policy number with corresponding insured information. If you do not have policy information, please contact us at 844-373-9914. Please enter your Life policy number with corresponding insured information. If you do not have policy information, please contact us at 844-373-9914.